Cocaine is a natural product extracted from the leaves of Erythroxylum coca Lamarck and Erythroxylum novogranatense (coca leaves). 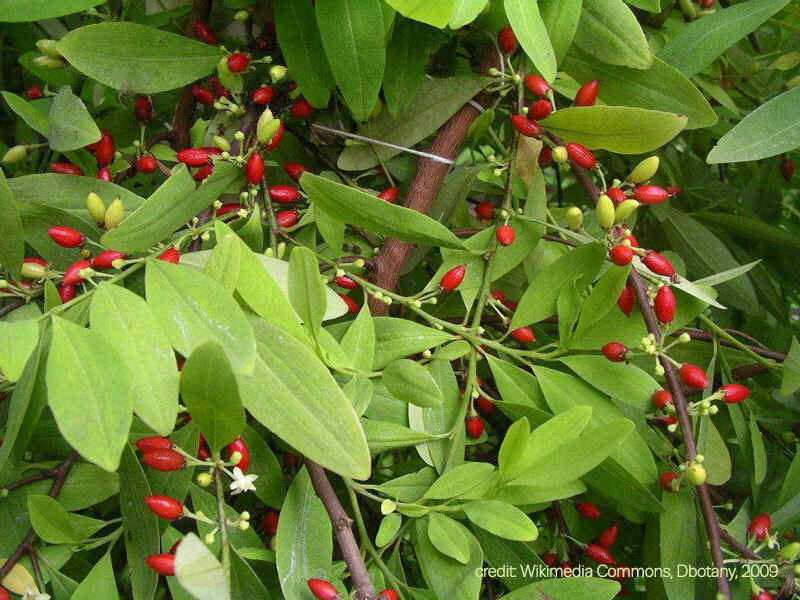 These tropical shrubs are cultivated widely in the Andean–Amazonian region, and are the only known natural source of cocaine, which is produced almost exclusively in Bolivia, Colombia and Peru. In these countries the leaves play a significant cultural role, having spiritual, therapeutic and social functions. In Bolivia and Peru, some growing of coca is permitted to supply licit domestic consumer markets for coca leaves and to supply de-cocainised flavouring agents to international manufacturers of soft drinks. The extraction of cocaine alkaloids from the coca leaves also takes place almost exclusively in the three producer countries and they also account for the majority of the global production of cocaine hydrochloride. However, some cocaine processing laboratories have been detected in other South American countries and elsewhere, including Europe, and globally over 9 000 cocaine-type laboratories were dismantled in 2013 (UNODC, 2015). The available data suggest that in 2014, after several years of decline, the surface area under coca cultivation in the Andes increased again slightly, mostly due to a significant increase in the coca acreage in Colombia. While fewer data are available on cocaine manufacture, what there are suggest a similar trend. In Europe cocaine is available in two forms and is mainly consumed in the south and west of Europe. Cocaine powder is a hydrochloride salt (HCl) and is primarily sniffed or snorted but is also sometimes injected. It is the most common form and is generally used infrequently, but a small proportion of users consume it more frequently and may experience problems. Less commonly available is crack cocaine, a smokeable (free base) form of the drug; there are a few countries with small groups of people who use crack cocaine in a more harmful way, often in conjunction with heroin use. The crack cocaine available in Europe is typically manufactured from cocaine hydrochloride near where it is retailed and used and so there is very little cross-border or long-distance crack trafficking. Cocaine is the most consumed stimulant drug in Europe, with a retail market value estimated by the European Monitoring Centre for Drugs and Drug Addiction (EMCDDA) to be about EUR 5.7 billion a year. It is also estimated that approximately 91 tonnes of cocaine are consumed in Europe every year. Cocaine is the second most seized drug in Europe, after cannabis. In 2014 about 78 000 seizures of cocaine were reported in the European Union (EU), yielding an estimated 61.6 tonnes of the drug. The situation has been relatively stable since 2010, although both the number of seizures and the volume seized are at levels considerably lower than the peak values reached in the mid to late 2000s. 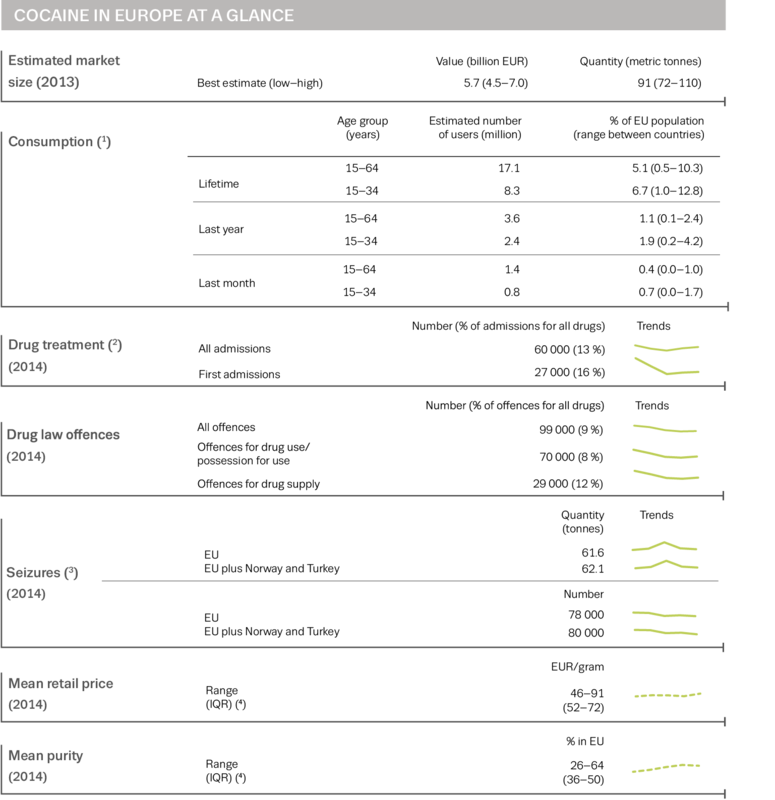 In 2014, 9% of the drug law offences in the EU (99 000) related to cocaine, 29 000 of which were drug supply offences.. Cocaine is trafficked to Europe from the producer countries of South America by both air and sea, using a range of methods and routes. Cocaine is shipped from Latin America to Europe in vessels departing from Brazil and other countries such as Ecuador and Venezuela. 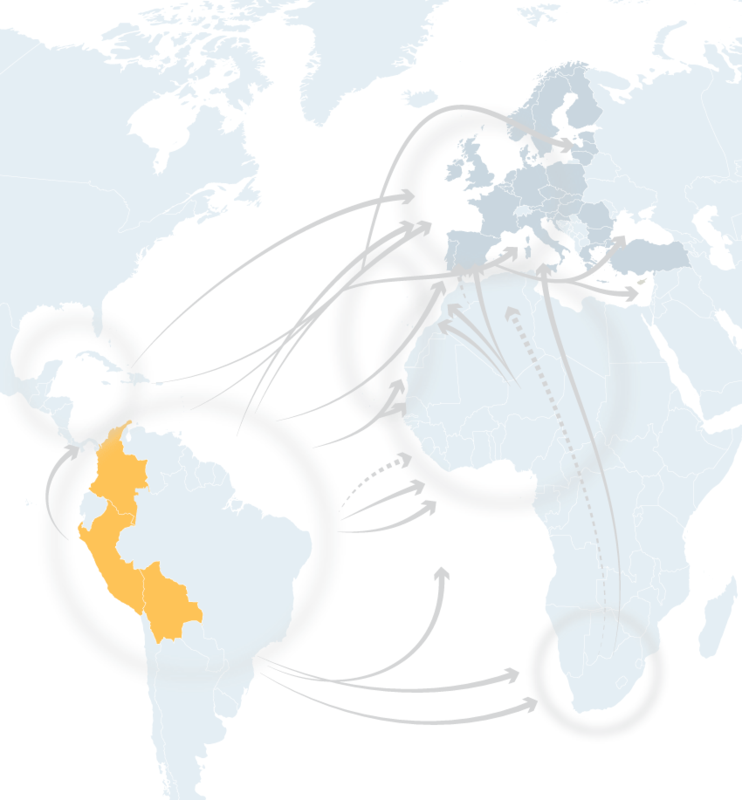 The increasing use of Brazil as a departure point reflects the growing importance of Bolivia and Peru as the source of cocaine shipped to Europe. Venezuela has become more important in recent years as trafficking organisations move Colombian cocaine overland across a porous border and take advantage of the busy maritime traffic between the coast and the islands of the Caribbean, but cocaine is also trafficked from Venezuela to Europe by air, either directly or via the Caribbean and Africa. Although Colombia appeared to have declined in importance as a direct departure point for cocaine heading to Europe over recent years, large seizures continue to be made on the Caribbean coast, including a 7 tonne shipment destined for the Netherlands seized in Cartagena in April 2014. This and the recent upturn in production suggests that Colombia is likely to remain an important departure point for maritime shipments of cocaine. Cocaine is also shipped through the southern cone of Latin America, particularly Argentina. There are two main areas through which cocaine shipments transit en route to Europe. The first is the Caribbean, where the Dominican Republic and Jamaica are considered the main hubs, although operations elsewhere appear to have pushed some trafficking through the eastern Caribbean. Central America and the Caribbean was the only region in which cocaine seizures rose in 2013 (UNODC, 2015). This apparent increase in the use of the Caribbean route may be a reflection of recent crackdowns in Mexico and Central America (Eventon and Bewley-Taylor, 2016). From the Caribbean the cocaine is generally shipped by sea via the Azores or by air, either on direct flights or through a variety of different transfer points. The other major transit area includes the West African mainland and neighbouring islands, Cape Verde, Madeira and the Canary Islands, although there has been some reduction in seizures in this area in recent years following a marked increase in seizures between 2004 and 2007. From West Africa, the cocaine is transported onward to Europe by air, sea or land routes. Transport through North Africa taking advantage of pre-existing cannabis routes is a concern, as occasional large seizures are made, although it is likely that routes through the region are fluid and transient (Algeria recorded a sudden spike in seizures in 2012, for example). 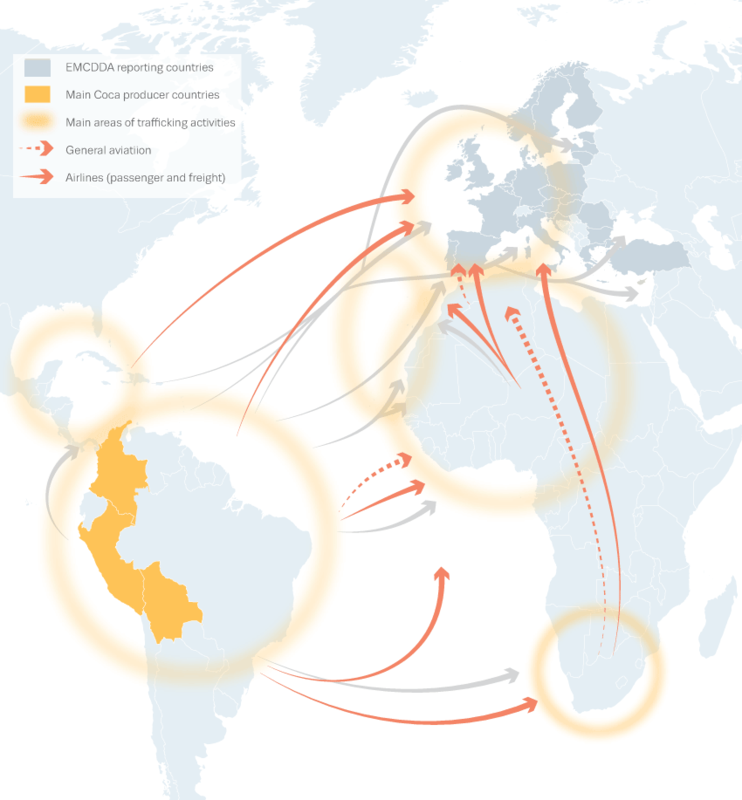 Trafficking of cocaine into Europe appears to mainly take place through western and southern countries, with Spain and Portugal in the south and ports in the Netherlands and Belgium in the north being the most important entry points for South American cocaine reaching the European market. It is estimated that together Spain, Belgium, the Netherlands, France and Italy accounted for around four-fifths of the cocaine seized in the EU in 2014. In the past few years, seizure data have suggested some use of south-eastern Europe as an entry point, spurring talk of an emerging Balkan route, and even a ‘Balkan cartel’ for cocaine, overlapping the established heroin route. Some seizures in Baltic countries have also led to discussion of another possible passage for cocaine. However, the data suggest, first, that to date the use of these ‘routes’ appears to be sporadic, and, second, that they remain of minor importance compared with established primary routes but may indicate a spread of the cocaine market eastward, where traditionally other stimulants have predominated, and in particular a growing market in the Russian Federation. The European countries reporting the greatest number of interceptions of air couriers in 2013 were the Netherlands and Spain, followed by France and Portugal, and then the United Kingdom, Italy, Germany and Belgium(1). However, this may to some extent be a reflection of the resources directed towards such interceptions. Cocaine couriers come from a very wide range of countries, and couriers of over 100 different nationalities were intercepted in Europe in 2012–13. Generally, nationals of the intercepting country predominate, and as a result European nationals make up the majority of intercepted couriers (EMCDDA–Europol, 2016). Cocaine traffickers make use of a wide range of trafficking methods that are used flexibly and evolve over time in response to enforcement effort. Maritime transport allows the transportation of large quantities at one time, and over two-thirds of EU seizures in the period 2011–2013 involved this form of transportation. The nature of international commercial maritime traffic means that a vast number of routes can and will be used. In addition, smaller private boats are able to bring in large quantities of cocaine in single shipments, entering Europe at many points; in September 2014, for example, a private yacht carrying a tonne of cocaine that had been picked up in Venezuela was intercepted off the coast of Ireland (Roche, 2015). An important development has been an increase in the use of containers on commercial vessels to ship cocaine, making detection more difficult. Since 2006 maritime seizures that involve containers have increased while seizures from vessels have declined (Gandilhon, 2016). A diverse and continually evolving array of concealment methods is used, and the importation of cocaine in forms such as its incorporation into plastics or other materials that require chemical extraction in Europe continues to be a concern. Concealing the drugs within shipments of perishable goods is another common tactic as there are procedures to allow these to pass through ports more quickly. The methods used for container trafficking have also evolved. For example, there has been a shift from concealment within the container or cargo to the rip-on/rip-off method (see trafficking in containers — button 4), which by 2012 accounted for the majority of seizures. Corrupt officials and port employees facilitate this form of trafficking, and staff involved in the aviation industry can also be vulnerable in this regard, as illustrated by two cases of the arrest of Nigerian airline crew members in London for cocaine smuggling (EMCDDA–Europol, 2016). Cocaine trafficking by air involves individual couriers, air freight aboard commercial flights and the use of private aircraft. However, compared with maritime shipments the quantity transported by air is generally smaller, although the number of seizures of cocaine transported in this way is high, and this mode of transport does have the effect of spreading the risk for traffickers. Couriers transport cocaine on commercial flights, whether internally (swallowed or stuffed), in their baggage, or, less frequently, on their body. Some concealment methods, such as the use of cocaine incorporated into breast implants, involve surgical procedures on cocaine couriers and pose significant risks to the lives of couriers, while ingestion by smugglers of numerous packages can result in death if a package ruptures. Until recently, cocaine smuggled in this way was always in powder form; however, there has been a switch by the smugglers to the use of cocaine in liquid form, presumably in an attempt to avoid the scanning equipment now in place at several airports. Cocaine trafficking to Europe is conducted by organised crime groups that are characterised by diversity and adaptability. These groups are innovative and skilled in switching and modifying both trafficking routes and modi operandi to circumvent law enforcement activities. They are quick to identify and exploit new opportunities for cocaine trafficking. This includes taking advantage of new technology and methods to facilitate access to maritime containers loaded with cocaine (e.g. rip-on/rip-off) and for concealing cocaine (e.g. incorporating liquid cocaine into materials for later extraction). In addition OCGs also shift transit routes and storage points to capitalise on the presence of ineffective border controls, and areas where instability and poor governance make for weak law enforcement. Click on a means of transport below to see it highlighted on the map. Some of the cocaine that arrives in West Africa may be shipped overland to various countries in North Africa from where it may be shipped onward to Europe, following routes that may also be used for cannabis resin trafficking, or used to supply local markets. These routes are likely to be fluid and transient. 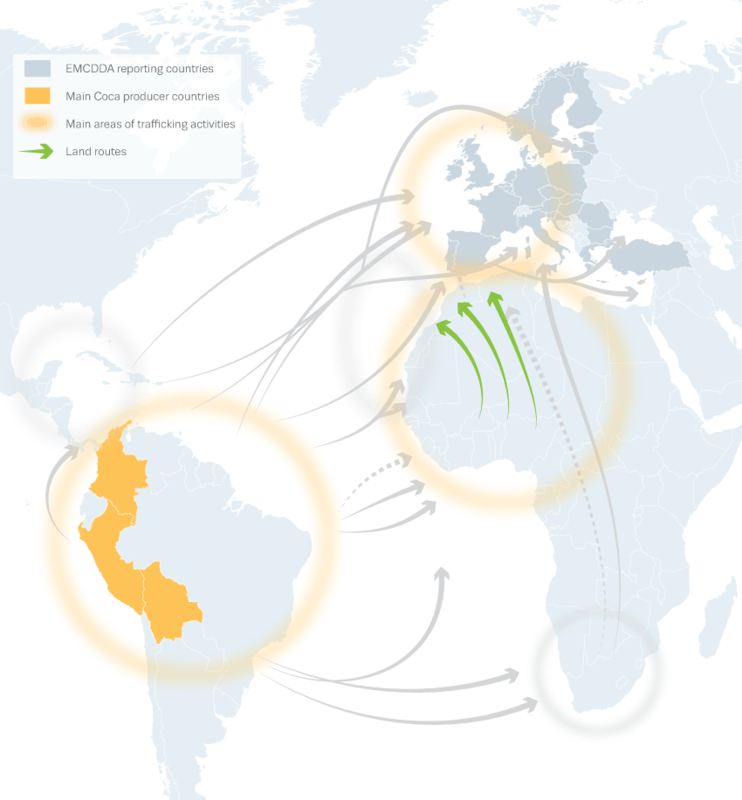 Cocaine produced in Colombia, Peru and Bolivia is shipped to Europe by sea from a number of South American countries including Brazil, Ecuador and Venezuela. Shipments from Colombia declined in recent years in response to law enforcement efforts but some trafficking through Colombian ports continues, while shipments from ports in southern Brazil appear to be increasing. Larger ships can travel direct to Europe while smaller vessels may transit en route. 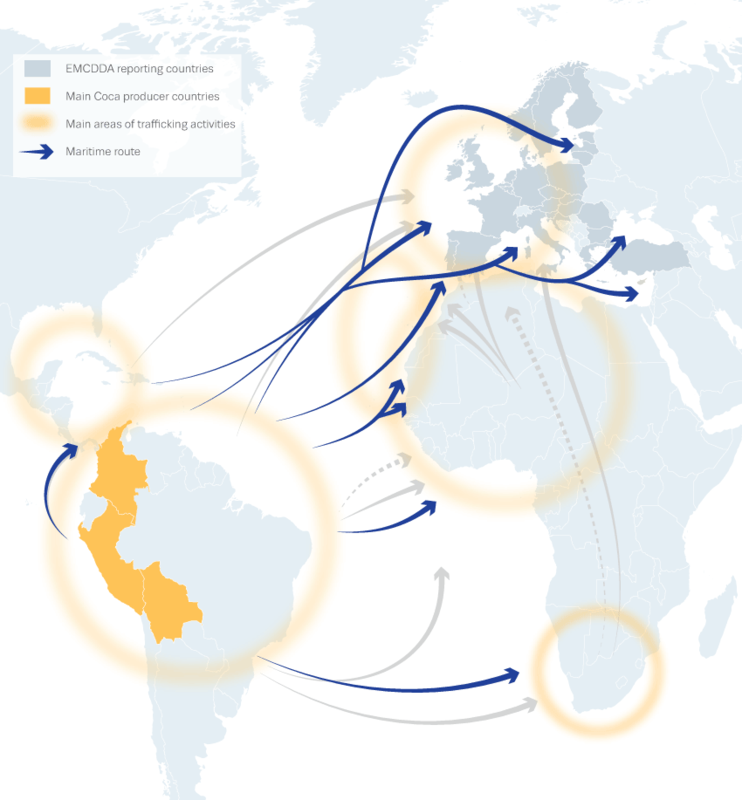 Central America and the Caribbean region is an important transit zone for maritime trafficking to Europe. The many ports and the variety of types of shipping, both commercial and pleasure craft, provide extensive opportunities for cocaine trafficking. The Dominican Republic and Jamaica are considered the main hubs in the Caribbean but Central America, for example Panama, is also important. The islands off the coast of West Africa, the Azores, Cape Verde, Madeira and the Canary Island, are located along long-standing sailing routes crossing the Atlantic. As a result, they are an important maritime transit area for cocaine en route to Europe, particularly for smaller vessels. The West African mainland around the Bight of Benin is another major transit point. Some cocaine may be transhipped here for onward transport by land or air or continue on by sea to Europe. However, seizures in the region have declined in recent years which may indicate a decline in the use of this route. Some cocaine is shipped to Southern Africa from where some may be transhipped and sent on to Europe by air. Most cocaine shipped to Europe by sea enters through ports in southern and western countries, Spain and Portugal in the south and the Netherlands and Belgium in the north. In recent years there has been a shift to trafficking in containers taking advantage of the huge volume of containers that go through major ports, such as Rotterdam, every day. Cocaine is trafficked from South America by air on commercial flights, using both individual couriers and airfreight. Routes include direct flights to Europe as well as flights to transit points for transhipment and onward transport by various means. Shorter flights within South America or to transit regions such as West Africa may also utilise general aviation, including private aircraft. Cocaine arriving in Southern Africa that is not destined for the local market may be transhipped and transported on to Europe by both commercial airlines, using individual couriers and airfreight, and general aviation. From West Africa, cocaine is trafficked by air on commercial flights using both individual couriers, who usually either transport the cocaine internally (swallowed or stuffed) or in their baggage, and air freight. West African organised crime groups, especially from Nigeria, feature prominently as organisers of cocaine trafficking using air couriers. Cocaine that has reached North Africa may be transported in small aircraft across into Europe, mostly Spain. Cocaine trafficked by air enters Europe through a wide range of airports. Common entry points include the Netherlands and Spain, France, Portugal, the UK, Germany and Belgium. Cocaine couriers from over 100 different countries were intercepted in 2012-13, but generally nationals of the intercepting country predominate. The methods of concealing cocaine are extremely varied and couriers often risk serious harm, for example as a result of rupturing of ingested packages or through surgery to insert cocaine filled breast implants. 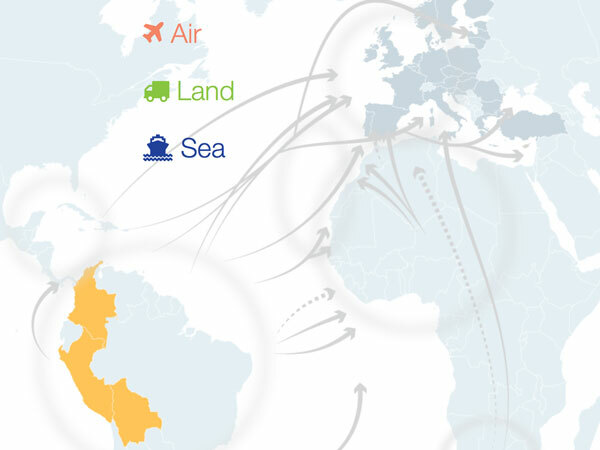 Some of the cocaine shipped from South America via the Central American and Caribbean region is transported by air on commercial flights by couriers or as airfreight. The destinations used often reflect historic and linguistic links, such as between Jamaica and the UK, Curaçao and Suriname and the Netherlands, or Guadaloupe and mainland France. The increase in the use of containers for trafficking cocaine to Europe has been marked in recent years and there has been a shift from concealment within the container or cargo to the rip-on/rip-off method (Gandilhon, 2016). The largest seaports in Europe are in Rotterdam, the Netherlands, and Antwerp, Belgium, and they are key points for this type of trafficking. After around 10 000 kg of cocaine was seized in Rotterdam over the course of 2013 it was reported that Dutch police estimated that 25–50 % of the cocaine reaching Europe now enters via the port, which handles around 11 million containers a year, only 50 000 of which are scanned (DutchNews, 2014, quoted in Eventon and Bewley-Taylor, 2016). However, large container ports in other countries are also used, such as Algeciras and Valencia in Spain, and Hamburg in Germany (EMCDDA–Europol, 2016). Corrupt officials and port employees facilitate this form of trafficking. There are concerns that the organised crime groups involved in cocaine trafficking may be making systematic efforts to corrupt workers in all major ports to facilitate shifting of routes as necessary in response to law enforcement activity. At the port of arrival, the drugs need to be retrieved, which can be achieved in a variety of ways. 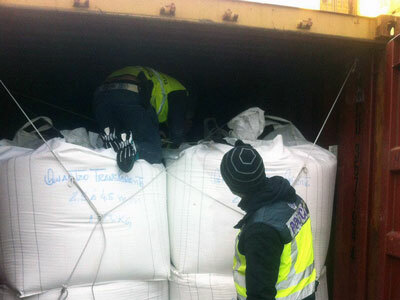 The drugs can be removed from the container by corrupt port workers or by external teams who gain access to the terminal. After the ‘rip-off’ is complete, the container is either left open or resealed with another false/duplicate seal. The success of the rip-off depends on knowing the location of the container within what is often a very large container terminal with tens of thousands of containers. However, just knowing the container number is usually not enough. It must also be accessible, which again usually requires a corrupt port or company worker to manipulate the position of the container. 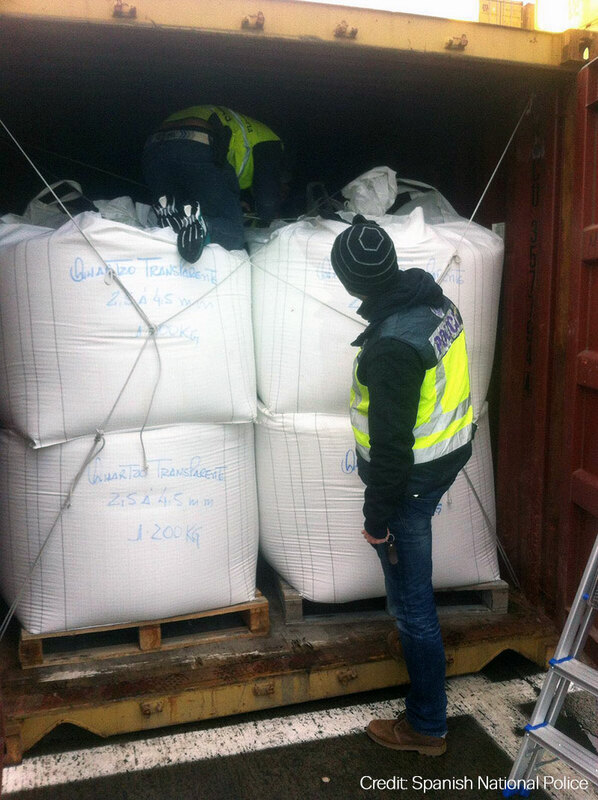 In December 2014 a joint customs–police team in Berlin examined a container transporting coffee. The container had left Santos, Brazil, and had arrived at Bremerhaven port, from where it would have been delivered to a coffee roaster in Berlin. Immediately after the container was opened, a sports bag and an unused container security seal were found. Inside the sports bag, 30 individual packages were found, each containing 1 kg of cocaine marked with a ‘horseshoe’ logo. 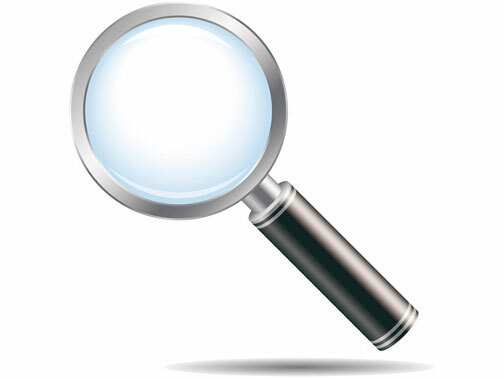 (1 )Based on a Europol data collection exercise covering 14 countries: Belgium, Bulgaria, Colombia, the Czech Republic, France, Germany, Hungary, Ireland, Italy, Portugal, Spain, Sweden, the Netherlands and the United Kingdom. EMCDDA (European Monitoring Centre for Drugs and Drug Addiction)–Europol (2016), EU Drug Markets Report 2016: Indepth Analysis, Publications Office of the European Union, Luxembourg. Eventon, R. and Bewley-Taylor, D. (2016), ‘An overview of recent changes in cocaine trafficking routes into Europe’, background paper for EU Drug Markets Report 2016, commissioned by EMCDDA. Gandilhon, M. (2016), ‘La cocaïne, une marchandise mondialisée’ [‘Cocaine: A world-wide commodity’], Drogues, santé et société, 15(1), pp. 21–34. Roche, B. (2015), ‘Three sentenced for EUR 300m cocaine smuggling operation’, Irish Times, 24 April.